The opioid epidemic in the United States resulted in 42,000 deaths in 2016, 40% of which involved a prescription opioid. It is estimated that 2 million patients become opioid dependent following elective, ambulatory surgery each year. There has been increased interest in quantifying the need for post-operative narcotic pain medications for a variety of surgical procedures. However, existing studies have been limited to general surgery procedures. In this study, we sought to quantify the analgesic usage following one of the most common operations performed in plastic surgery, bilateral breast reduction. In this prospective, observational study, sequential breast reduction patients were contacted by telephone on the evening of post-operative days three and seven. Patients were queried as to which analgesic medications were used on the day of the phone call. Data relating to dosage, frequency, and satisfaction with pain control was sought. Patients taking chronic narcotics, having a post-operative complication requiring surgical intervention, and those unable to be reached after multiple attempts were excluded. Complete data were obtained for 38 patients. Narcotic prescriptions were written for oxycodone (5mg tablets), hydromorphone (2mg tablets), and tramadol (50mg tablets), with the number prescribed ranging from 0 to 20 tablets. The median total number used was 5 tablets. Eighty percent of patients used a total of ten tablets or less. Fifty percent of patients were using only non-narcotic analgesia by post-operative day three. Of those receiving a prescription, only 20% used all of the narcotic pain medication prescribed to them. Patient-reported satisfaction with pain control was overwhelmingly positive, with 95% being either somewhat satisfied or very satisfied with post-operative pain control. Of those taking any medication on post-operative day three, only half were using a non-steroidal anti-inflammatory (NSAID) as part of their pain regimen. The number of tablets prescribed after breast reduction surgery varies considerably and there is no consensus regarding the appropriate number to prescribe. Currently, few patients use all the medication prescribed to them, indicating a high rate of over-prescribing. The overwhelming majority are satisfied with their pain control. Most patients use less than ten tablets of narcotic pain medication after surgery. Tylenol is widely used as an adjunct but NSAIDs remain under-utilized. Based on these data, we recommend that breast reduction patients be given a “standard” prescription for ten tablets of narcotic pain medication. 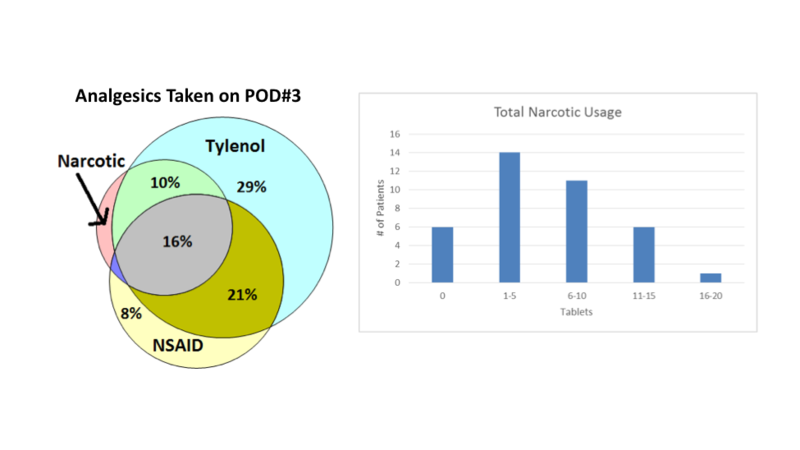 Use of both Tylenol and NSAIDs during the post-operative period should be emphasized.